The Manchester Tank team in Quincy, Illinois ended 2017 with a 2.16 total recordable injury rate and to thank team members for their commitment to working safe every day they recently held a ribeye steak cookout complete with twice baked cheesy potatoes, green beans, roll with tea and lemonade topped off with a Manchester Tank sheet cake. The cookout was catered by the local Hy-Vee Supermarket and team members really enjoyed the lunch. During the lunch, they reminded team members to follow the job safety analysis (JSA) for every job they perform and the importance of looking for and correcting any hazards in their work area and keeping an eye out for unsafe behaviors. By following these guidelines, they can have an even better 2018. The number one priority at Manchester Tank & Equipment in Quincy, Illinois (MTQ), is the safety of all of its team members. So when the Tri Township Fire Department asked MTQ to help purchase equipment for use during confined space rescues, they were more than happy to help out. MTQ has 75 confined space locations on their property. The self-contained breathing apparatus system that the fire department purchased will provide oxygen for two firemen for around an hour during a confined space rescue. 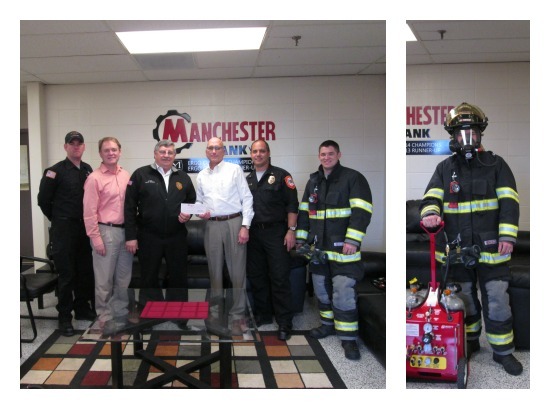 On December 3, MTQ EHS Manager Rick Nesbit presented a check for $1,750 to Tri Township Fire Chief Rick Zaerr. This is just one of the ways that McWane is paying it forward in the communities where our team members live and work.